The Pushkin State Russian Language Institute in Moscow is employing some unusual strategies to help students learn Russian. Rector Margarita Rusetskaya talked to RBTH about her school, how robots can help students study languages and how foreigners can study free in Russia. The Pushkin State Russian Language Institute in Moscow participated in the Sochi Robotics Days on Nov. 21-23, where it unveiled a website called Education in Russian, interactive lessons, and a robotic Russian language assistant named Vanya. RBTH interviewed the institute’s rector Margarita Rusetskaya about technology, the Russian language, and how foreigners can study free of charge in Russia. 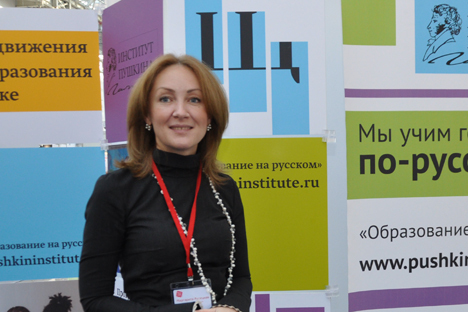 RBTH: Why did the Russian Language Institute participate in the Sochi Robotics Days? Margarita Rusetskaya: In my opinion, it should become the norm for all major international events held in Russia to have Russian as the primary working language. Kids from more than 50 countries came [Russia held the World Robot Olympiad for primary students as part of the event – RBTH]. The majority don’t know a word of Russian, so we gave them all the opportunity to start studying Russian on our website. Besides that, Russian master classes were organized for them during those days. They came to the country, they had free time, and they needed to communicate with the locals, so they could really benefit from Russian lessons. This is the first practical step. Maybe some people will leave and forget about this opportunity, but if at least a tenth of the 1,300 kids maintain an interest, that’s a good thing. RBTH: Am I correct that some courses on the Education in Russian website are free or open for all? M.R. : The website is open for anyone who has internet, and it is available from anywhere. Basic courses – for example, Russian at A1 and A2 level – are free. More advanced levels, where a live tutor is required, are not free, because you have to pay for a teacher’s working time. Furthermore, the website offers professional support modules for teachers, where training is completely free. Right now, there are already 2,500 teachers throughout the world taking that course. Naturally, it costs extra if a teacher wants to get an official diploma. What we do on the website isn’t just offer a set of games and exercises. We have created a product that can evaluate the educational trajectory of every person who enters the website and, depending on his or her results, accompany him or her, recommend additional exercises, and arrange modules with extra resources. In order to make that possible, the website was built using the latest developments in programming, linguistics, cyber linguistics, and neurolinguistics. RBTH: What technology does it use? M.R. : For example, we have a project with the company ABBYY, which among other things does artificial speech synthesis on the basis of semantic search engines. In other words, their software lets you automatically assess the accuracy and literacy of a text. These developments are being used on our website in the linguistic module. RBTH: You also presented an assistant teacher of Russian – a robot named Vanya. The robot itself was developed by the French, and the programming that allows it to generate speech and communicate belongs to Chelyabinsk-based programmers and specialists in Russian philology. What does it do? M.R. : Robots like Vanya are very good as motivational toys that can be used when you need to attract and maintain the interest of school-age children. Vanya isn’t supposed to provide deep language study, which is why we call him an assistant teacher instead of a teacher. As an assistant, he can help remove the psychological barriers to communication. RBTH: How do you help Russian language teachers abroad? M.R. : The main help we provide is language courses in Russia. Our foreign colleagues say they have studied all the theory but lack practice. Even young people say that – they don’t have enough live communication in Russian, they don’t have enough new words, meanings, patterns, and phrases from new films that enter everyday speech, and so forth. Plus, they lack rules for modern business communication and correspondence, as well as speaking in public in Russian. By the end of this year, more than 10,000 teachers will undergo professional training. That’s more than 25 countries in the CIS, the United States, Latin America, the Asia-Pacific region, and Africa. RBTH: How can students come to you? Do you have any scholarships available? M.R. : According to existing standards, getting a Russian as a foreign language teaching certification requires a master’s program. So for starters a student needs a basic bachelor’s degree. If they don’t have that, they’ll have to get a philology or linguistics education. It’s a two-year program. Foreign students are given free spots, which are selected in conjunction with the Ministry of Education and Rossotrudnichestvo [an agency aimed at fostering friendly ties in order to advance Russia’s political and economic interests abroad - RBTH]. In order to participate in the program, you need to submit a package of documents through Rossotrudnichestvo points abroad. You don’t have to go to their office – you can submit the documents remotely. When submitting the documents, you need to indicate your preferred university, after which the application is sent there for review.